Today was beautiful. I had really thought I might get in a 3-4 miler, but I thought it was best to rest the running legs (and feet) since I did go farther yesterday. Instead, I hit the gym. But man oh man the sunshine was so inviting. However, every once in a while you see some funny stuff at the gym that you might not witness running. Though, you witness a lot of funny sh^t running I must say. I never thought I'd have to put this on a do-not-do-at-the-gym list - but this one is going on there. Men, please wear workout shorts, not tights, not underwear-looking booty shorts. Please for the love of anything and everything holy, don't do it. I've never seen this particular person up there and it was all I could do not to just flat out stare. I noticed him at first because I hear this crazy noise - he was doing burpees, but horribly wrong. It's like he was jumping up with shoulders and back still rounded down so it looked like one of those scared cat cartoon drawings. But then I noticed the shorts - tights like that ride up mind you. So they were booty shorts to say the least. And he didn't have much to be showing. I'm just glad other...ahem...things didn't fall out. Yes, I sound ugly I'm sure, but seriously??? Ok, back to my workout...I started with my typical warmup on the elliptical before going for back and shoulder. I did supersets of 4 sets of 8 reps followed up with a dropset. I also did 3 sets of 10 reps of low-back extensions and some ab work. As I mentioned yesterday, dinner tonight was pre-made on Sunday night. I had a spaghetti squash that had seen much better days. So, I just roasted that up. 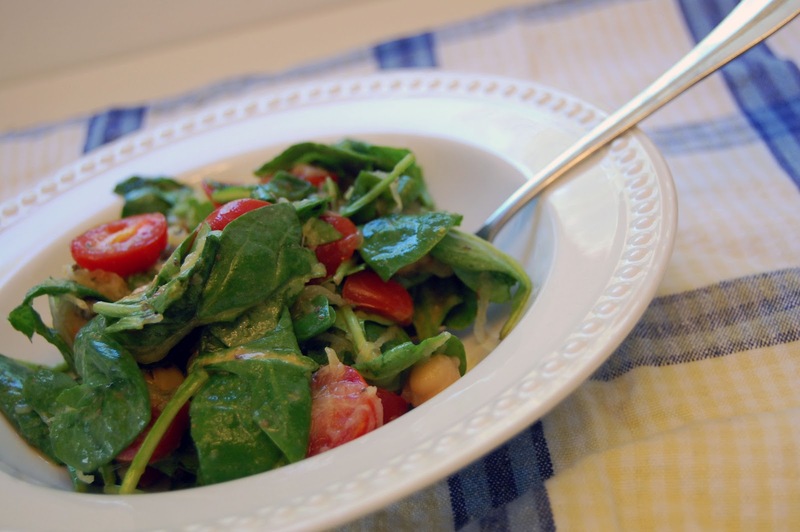 While it was cooking, I just tossed several ingredients into a large bowl: spinach, cherry tomatoes, capers, chickpeas and seasoned with salt, pepper, nutritional yeast flakes, oregano, basil, parsley. I also added in a bit of lemon juice to brighten the flavors. When the squash was done, I shredded it over the ingredients, tossed and covered to allow the heat/steam from the squash to wilt the spinach.